You are here: Home / News / Celebrate the new look Fitzroy Street on 4th Oct at the Fitzroy Street Fiesta. 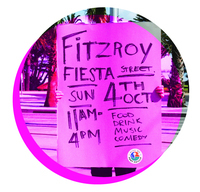 Celebrate the new look Fitzroy Street on 4th Oct at the Fitzroy Street Fiesta. St Kilda’s Fitzroy Street has been refurbished as part of the Foreshore Connections project. To celebrate the opening there will be free entertainment at the beach end of Fitzroy Street for the Fiesta. There’ll be something for everyone including Circa Nica, Roller Derby demonstrations, food, live dj’s, rock climbing, mini golf, kids art, roving entertainment and more! Bring your family and friends down and join in the fun! Saturday 4th October from 11am. Tram routes 112 and 16 will get you there.